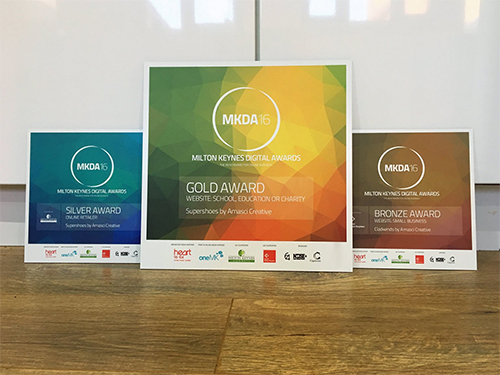 Guild members Amasci Creative certainly had a great night at the 2016 MK Digital Awards on October 13th when they scooped no less than three awards. They had four websites shortlisted as finalists across 5 different categories. The Supershoes website won two awards - Gold for the School, Education or Charity category, and Silver for The Online Retailer category. The clean, bright and easy to navigate Supershoes website makes it almost effortless for anyone to donate varied amounts of money to provide customised gifts for children and young people battling cancer in the UK. A Bronze award for Small Business Website was also awarded to Amasci for the website Cladwinds. We think the Amasci Creative team should be feeling extremely proud right now! Director Terry Upton told us: "I am delighted to have won the Gold Award for the Supershoes website. It’s fantastic to receive some recognition for the work and effort that I put into building the website. With all websites, I try to build them using the latest standards and best practices and do the very best job possible, going above and beyond for the client. So it really is great to receive some credit for this. The Supershoes projects was such a great project to be involved wit. Hopefully this award will help to further spread the word for the fantastic work that they do. They are such a fantastic client."